Use the MP3s on your computer to become the ultimate DJ at any party. With intuitive drag and drop playlist creation and automatic beat matching, you can create professional sounding party mixes with ease. 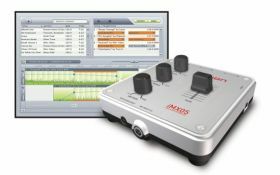 The software will automatically crossfade, align, and tempo adjust your songs for seamless transitions. The USB audio interface requires no drivers to work--simply plug it into your computer's USB port and you're set. It also draws power from the USB bus, meaning no annoying "wall wart" AC adapters to deal with. On the back of the Express DJ, you'll find two sets of RCA outputs and a pair of 1/4-inch outputs. All three output your signal, so you can send to multiple amplification sources--stereo systems, PAs, amplifiers, and more--at once. Use the two inputs on the front panel of the unit to connect a 1/4-inch or 1/8-inch microphone, and add some live vocals to your mix. A microphone is included to get you going right away. Note: microphone signal is not sent to USB connection; only one microphone input can be used at a time. Use the EQ on the interface box to adjust the sound, pumping up the bass or treble to your liking. The master volume controls the whole program, ideal for fadeouts and keeping your levels in check. This is where it all goes down. Easily create professional sounding party mixes with intuitive drag and drop playlist creation and automatic beat matching. Included software will automatically crossfade, align, and tempo adjust your songs for seamless transitions. You can save your mixes to listen to on your iPod or other personal audio player.